JMSC POS® system is built ground-up using innovative technology for creating ideal business systems for retail enterprises. 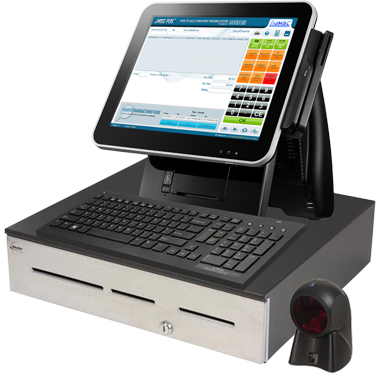 Change the way your point of sales terminal provides services to the customers of your store! With powerful retail technology at the core of our system, revolutionize the way your store functions! User-friendly touch screen displays now fully-integrated into the JMSC POS® System helps increase competitive edge, reduce inventory delays, improve sales, maximize productivity, and enhance the customers’ experience across all retail and hospitality environments! Customized By Retailers, For Retailers! Since 24 years, we have been running Convenience & Liquor stores in the United States. Our experience in the retail business has lent us an upper hand in understanding the intricate nuances faced whilst running a retail store. We have personally faced and learnt from the challenges faced by retail business owners. With a unique understanding of user requirements, We have developed and designed our own Point Of Sale System and Inventory Management System with complete functionality based on actual needs of any retail business. Our firm belief stems from the fact that quality support is the key to success! JMSC POS® system is built ground-up using innovative technology for creating ideal business systems for retail enterprises. By providing a powerful yet easy-to-use, cost-saving capability far beyond that you can expect from conventional cash register or generic point of sale systems and software applications. Our POS system is powered for capturing and utilizing sales information as well as develop strategies for spearheading you ahead of the competition. It increases efficiency and improves accuracy, lower operating costs and manages your inventory by reducing theft&losses, and zero stock situations. JMSCPOS System can be used for Convenience Store, Liquors Store, Tobacco Store, Grocery Store and Retail Businesses. We provide POS System in entire USA including Illinois, Tennessee, New Jersey, Georgia, New York, Ohio, Pennsylvania, Massachusetts, Missouri, Nevada, North Carolina, South Carolina, Texas, Florida, Washington, Wisconsin. The Scan Data function makes available part of your sales data, which is particularly only the sales figures for trend analyses and studying for companies such as Philip Morris, RJ Reynolds, etc. JMSC POS is certified with major companies for Scan Data. These companies provide motivational incentives for providing such sales trends data at regular intervals. Such data is asked for, to improve their production & delivery timelines to various regions as well as restructure any or all sales promotion-based activities for further driving up their sales. The benefits of these reports, which need to be sent regularly, is reflected in your bank accounts through our Buy Down function! With ever evolving technology, we make it an endeavor to stay ahead of the times. Better yet – ahead of the competition! That’s what we do at JMSC Inc. In our JMSC POS Terminal software, we have included complete support for the newly rolled out EMV standard for smart payment cards through payment terminals. The EMV– originally Europay, MasterCard, and Visa – is now managed by EMVCo, a consortium comprising Visa, Mastercard, JCB, American Express, China UnionPay, and Discover. These companies control, define & regulate the usage & security of contact cards, as well as contactless cards such as PayPass, PayWave, ExpressPay. Contact cards need to be physically inserted into a reader, whereas contactless cards can be easily read over a short distance using radio-frequency identification (RFID) technology. Newer EMV (Europay, MasterCard and Visa) cards have integrated circuits instead of magnetic stripes. However, many companies still issue many EMV cards with such magnetic stripes for backward compatibility across different regions or countries. Payment cards that comply with the EMV standard are now becoming the norm, most commonly nowadays people using the latest contact less cards. This makes for greater convenience for the user or customer as well as the Store owner or terminal operator where time is of essence. Notwithstanding the increased security levels of such latest cards, the newer EMV standard is now becoming the norm making it absolutely necessary for your POS Terminal software to be ready to support all these latest security functions and facilities! Every store now needs to come up with something new on offer to retain its loyal customers, or better get newer customers to stay in business. Nothing beats the classic style of making a sale with bargains of customers’ favorite products time and again! Yet today, gifting remains the most tried and tested way to please your friends, family, colleagues, or your special loved one! Customers now face a more difficult scenario of gifting than before. Choices of type, color or size of products differs between people. That’s why people now like to gift a coupon or rather a gift card such that the recipient may themselves go and get what they would like and keep it forever! As a store owner, it is imperative that you need to provide such customers with gift cards for them to gift someone! However, Every store needs to have a tie up with another company which incurs transaction fee payable to such companies for them providing support for processing gift cards. This means your Customer would be charged or levied these extra charges as applied by other gift card supporting companies else you would be making a loss, wouldn’t you!? With our JMSC POS Terminal software, you can forget about creating, distributing, tracking and processing such gift cards anymore! All of this and much much more functions are already pre-built into our software! All you need to do is simply select how many gift cards need to be printed and our software will do the rest! That’s It! 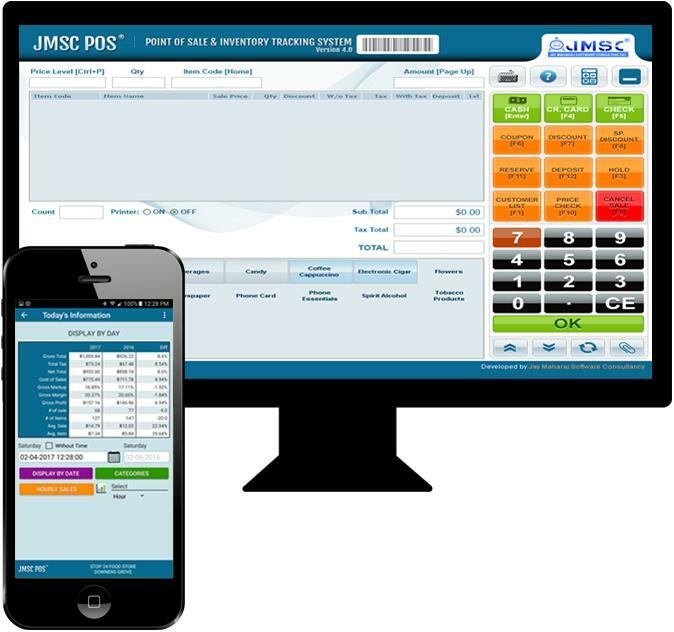 Call us to know more details about such fantastic features built into our leading JMSC POS Terminal software NOW! We offer POS System and Support in Illinois, New Jersey, New York, Pennsylvania, Indiana, Ohio, New Hampshire, Virginia, North Carolina, South Carolina, Georgia, Florida, Connecticut, Tennessee (TN), Massachusetts.